The common safety methods (‘CSMs’) describe how the safety levels and the achievement of safety targets and compliance with other safety requirements are assessed. In accordance with Article 6(5) of Directive (EU) 2016/798, the CSMs are to be revised at regular intervals, taking into account the experience gained from their application and the global development of railway safety and with the objective of generally maintaining and, where reasonably practicable, continuously improving safety. By its Implementing Decision of 1 September 2016 (2), the Commission gave a mandate to the European Union Agency for Railways (‘the Agency’) in accordance with Article 6(2) of Directive (EU) 2016/798 to revise Commission Regulations (EU) No 1158/2010 (3), (EU) No 1169/2010 (4) and (EU) No 1077/2012 (5). On 9 March 2017, the Agency issued its recommendation, enclosing a report on the results of the consultation of national safety authorities, social partners and users and a report assessing the impact of the amended CSMs to be adopted, to address the mandate of the Commission. The Commission examined the recommendation issued by the Agency to verify that the mandate was fulfilled as referred to in Article 6(4) of Directive (EU) 2016/798. After a single safety certificate or a safety authorisation is issued, the national safety authority should conduct supervision activities to check whether the safety management system arrangements are effectively used during operation and that all the necessary requirements are complied with on a continuous basis. In accordance with Article 17(1) and (8) of Directive (EU) 2016/798, in cases where railway undertakings and infrastructure managers are also entities in charge of maintenance that are not certified in accordance with Article 14(4) of Directive (EU) 2016/798, supervision activities carried out by national safety authorities with the aim of checking the application of the relevant CSMs referred to in Article 6 of Directive (EU) 2016/798 by entities in charge of the maintenance are justified means for supervising the effectiveness of the safety management systems of these railway undertakings and infrastructure managers. A supervision process should be set out for the national safety authorities with the aim of improving mutual trust in their approaches to, and decision-making during, supervision activities. National safety authorities should be accountable for their decisions and therefore, should have internal arrangements or procedures against which they can be held to account. Supervision should be targeted primarily at those activities which a national safety authority believes give rise to the most serious risks or where the risks are least well-controlled. For that purpose, the national safety authority should develop and implement a risk-based supervision strategy and plan(s) outlining how it targets its activities and sets its priorities for supervision. Enforcement actions taken by national safety authorities to ensure that railway undertakings and infrastructure managers achieve legal compliance as referred to in Article 17(1) of Directive (EU) 2016/798 should be proportionate to any risks to safety or to the potential seriousness of any non-compliance with their legal obligations. To be able to perform its tasks under point (i) of Article 16(2) of Directive (EU) 2016/798, the national safety authority should form a judgement, based on the outcomes of its supervision activities, on the effectiveness of the safety regulatory framework. The audit and inspection techniques for supervision should commonly include interviews with people at various levels in an organisation, reviewing documents and records related to the safety management system and examining the safety outcomes of the management system revealed by inspections or related activities. In accordance with Article 17(13) of Directive (EU) 2016/798, the Agency, acting as safety certification body, and the national safety authorities should coordinate when and where appropriate to ensure the full exchange of information between assessment and supervision activities, including any notices addressed to railway undertakings. Similarly, the relevant national safety authorities should coordinate in the case of cross-border infrastructures. In order to ensure that supervision is carried out effectively by national safety authorities and to reinforce mutual trust between them, those authorities should ensure that staff involved in supervision have the necessary competencies. To that end, those competencies should be identified. National safety authorities involved in the supervision of an infrastructure manager with cross-border infrastructure or of a railway undertaking operating in more than one Member State should cooperate with each other to avoid any duplication of supervision and coordinate their approach to supervision to ensure that any key information on the infrastructure manager or railway undertaking, particularly on known risks and its safety performance, is shared and used to target supervision activities on the areas of greatest risk for the whole operation. National safety authorities should cooperate, where necessary, with other competent authorities or bodies that interact in the railway sector, such as the regulatory bodies and the licensing authorities within the meaning of Directive 2012/34/EU of the European Parliament and of the Council (6), or the competent authorities for monitoring compliance with applicable working, driving and rest-time rules for train drivers, to deliver their respective mandates, share information, resolve any conflicts in approach, prevent related adverse effects in the railway system and coordinate their response to any failure to comply with the safety regulatory framework. According to Article 31(3) of Directive (EU) 2016/798, the new safety certification regime will start from 16 June 2019. However, Member States have the possibility to notify the Agency and the Commission pursuant to Article 33(2) of Directive (EU) 2016/798 that they have extended the transposition period and may in consequence continue to issue certificates in accordance with Directive 2004/49/EC of the European Parliament and of the Council (7) until 16 June 2020. It is therefore necessary to align the application dates of this Regulation with the dates set out in Directive (EU) 2016/798 in order to allow smooth transition to the new certification regime. This Regulation establishes common safety methods (‘CSMs’), referred to in point (c) of Article 6(1) of Directive (EU) 2016/798, for the supervision of the management of safety by national safety authorities after the railway undertakings have been granted a single safety certificate and infrastructure managers after they have been granted a safety authorisation. ‘residual concern’ means a minor issue identified during the assessment of an application for a single safety certificate or for a safety authorisation which does not prevent their issuing and can be deferred for later supervision. 1. National safety authorities shall apply the supervision process set out in Annex I. 2. National safety authorities shall establish internal arrangements or procedures for managing the supervision process. 3. For the purposes of supervision, the national safety authorities shall accept the authorisations, recognitions or certificates of products or services provided by railway undertakings and infrastructure managers, or their contractors, partners or suppliers, granted in accordance with relevant Union law, as proof of the ability of railway undertakings and infrastructure managers to fulfil the corresponding requirements defined in Commission Delegated Regulation (EU) 2018/762 (8). National safety authorities shall adopt suitable techniques, such as audits and inspections, and select the most appropriate ones when planning their supervision activities. 1. The national safety authority carrying out supervision shall use and, where relevant, share information gathered on the performance of the safety management system during its supervision activities for the purpose of renewing or updating single safety certificates or safety authorisations. 2. In cases where the national safety authority referred to in paragraph 1 is not responsible for issuing the single safety certificate or safety authorisation, it shall coordinate promptly with the Agency acting as safety certification body or the relevant national safety authority, in the case of cross-border infrastructure, on its request, after the receipt of an application for renewal or update. the status of the action plan (or plans) established by the railway undertaking or infrastructure manager to resolve residual concerns from previous assessment. problem solving, communication and teamworking. 2. In the case of teamwork, the competencies may be shared amongst the team members. 1. The national safety authority shall establish and publish decision-making criteria on how it evaluates the correct application of a safety management system by a railway undertaking or an infrastructure manager and the effectiveness of the safety management system in controlling safety risks associated with the activities of the railway undertaking or infrastructure manager. These criteria shall include information on how the national safety authority manages and deals with non-compliances identified in the safety management system of the railway undertaking and infrastructure manager. 2. The national safety authority shall adopt and publish a procedure detailing how railway undertakings, infrastructure managers and any other interested party may submit a complaint on decisions taken during supervision activities. 1. National safety authorities involved in the supervision of an infrastructure manager with cross-border infrastructure(s) or of a railway undertaking operating in more than one Member State shall coordinate their approach to supervision in accordance with Article 17(7) and (9) of Directive (EU) 2016/798. After the granting of the safety authorisation or single safety certificate, national safety authorities shall promptly decide which of them is to have a leading role for coordinating the supervision of the correct application and effectiveness of the safety management system, without prejudice to the obligations of the national safety authorities under points (d) and (j) of Article 16(2) and Article 17 of Directive (EU) 2016/798. 2. For the purposes of paragraph 1, the national safety authorities shall develop arrangements based on the framework for coordinated and joint supervision set out in Annex II. 3. National safety authorities shall also develop cooperation arrangements with the national investigation bodies, certification bodies for entities in charge of maintenance and other competent authorities or bodies. Regulation (EU) No 1077/2012 is repealed with effect from 16 June 2019. It shall apply from 16 June 2019. However, Article 5(2) and Article 8(1) and (2) shall apply from 16 June 2020 in the Member States that have notified the Agency and the Commission in accordance with Article 33(2) of Directive (EU) 2016/798 that they have extended the period for transposition of that Directive. (2) Commission Implementing Decision of 1 September 2016 on a mandate to the European Union Agency for Railways for the revision of the common safety methods for conformity assessment and the common safety method for supervision and repealing Implementing Decision C(2014) 1649 final (C(2016) 5504 final). (3) Commission Regulation (EU) No 1158/2010 of 9 December 2010 on a common safety method for assessing conformity with the requirements for obtaining railway safety certificates (OJ L 326, 10.12.2010, p. 11). (4) Commission Regulation (EU) No 1169/2010 of 10 December 2010 on a common safety method for assessing conformity with the requirements for obtaining a railway safety authorisation (OJ L 327, 11.12.2010, p. 13). (5) Commission Regulation (EU) No 1077/2012 of 16 November 2012 on a common safety method for supervision by national safety authorities after issuing a safety certificate or safety authorisation (OJ L 320, 17.11.2012, p. 3). (6) Directive 2012/34/EU of the European Parliament and of the Council of 21 November 2012 establishing a single European railway area (OJ L 343, 14.12.2012, p. 32). (7) Directive 2004/49/EC of 29 April 2004 of the European Parliament and of the Council on safety of the Community's railways and amending Council Directive 95/18/EC on the licensing of railway undertakings and Directive 2001/14/EC on the allocation of railway infrastructure capacity and the levying of charges for the use of railway infrastructure and safety certification (Railway safety Directive) (OJ L 164, 30.4.2004, p. 44). (8) Commission Delegated Regulation (EU) 2018/762 of 8 March 2018 establishing common safety methods on safety management system requirements pursuant to Directive (EU) 2016/798 of the European Parliament and of the Council and repealing Commission Regulations (EU) No 1158/2010 and (EU) No 1169/2010 (See page 26 of this Official Journal). The national safety authority shall develop a structured and auditable process for the complete activity which takes into account the elements below. 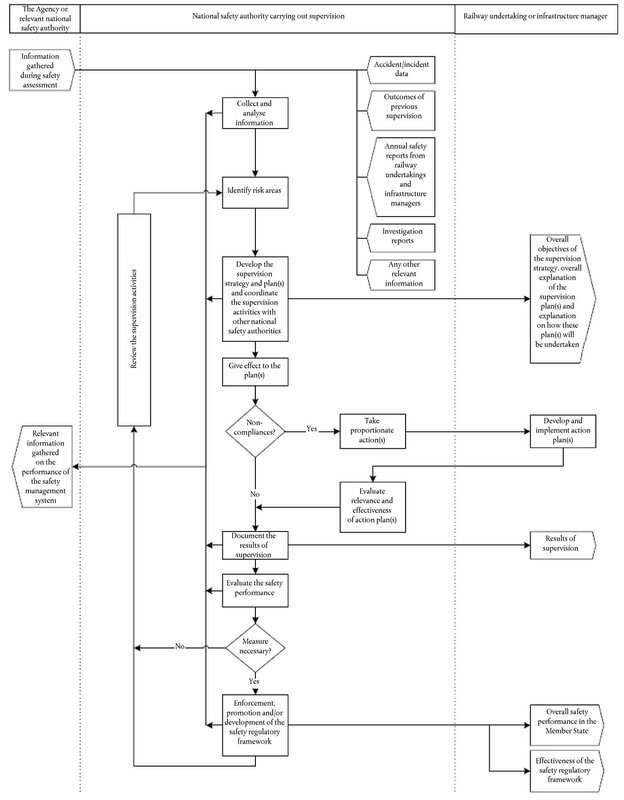 This ensures that the supervision process is iterative and takes into account the need to continually improve, as shown in the diagram below in the Appendix. address in the supervision strategy and plan(s) any matters relating to cross-border operations or infrastructure(s) through coordination with other national safety authority (or authorities). provide relevant railway undertakings or infrastructure managers with an overall explanation on how the supervision plan or plans will be undertaken. document the results of its supervision activities. where appropriate, take any enforcement actions, identify whether there is a case for restricting or revoking the single safety certificate or safety authorisation and in cases where it is not responsible for issuing the single safety certificate or safety authorisation, inform the competent authority accordingly. contribute when necessary with its views and any proposals to its Member State to overcome any deficiencies in the safety regulatory framework. Agree which railway undertakings and infrastructure managers are operating in such a manner as to require coordinated or joint supervision. Agree on common language(s) and the level of confidentiality of the information to be used for the purposes of their coordination arrangements. share information on the safety performance of railway undertakings and infrastructure managers identified under point 1 in each Member State. establish a dialogue between relevant national safety authorities on the proposed response to dealing with major compliance gaps. plan efficiently individual, coordinated or joint initiatives without causing unnecessary inconvenience to the railway undertakings and infrastructure managers and by avoiding overlaps in the scope of these initiatives. Agree on which national safety authority (or authorities) should follow up actions aimed to address residual concerns which have been deferred for supervision where appropriate. agree how railway undertakings and infrastructure managers should be made aware of the arrangements and agreements national safety authorities are reaching. develop arrangements to evaluate the effectiveness of the coordination and cooperation between national safety authorities, including the Agency as appropriate.